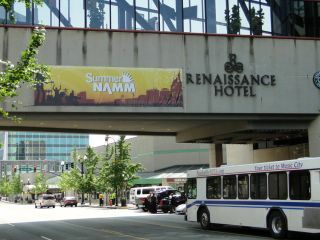 Details of the 2013 Summer NAMM show in Nashville, Tennessee have been announced. The music industry trade show is the smaller sibling of the massive annual Winter NAMM show in Anaheim, but is still the third largest event in the music industry calendar. This year sees the show move to a new home in Nashville's Music City Center complex. The show will take place 11 - 13 July, with Saturday 13 being a public day, during which consumers can visit the show for the cost of $10 in advance of $20 on the door. As ever MusicRadar will be on the show floor to report on all the new gear, show highlights and artist appearances. For more info visit the official NAMM website.